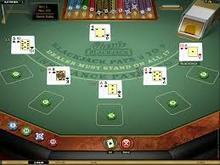 Blackjack is a card game that is played in both brick-and-mortar and online casinos. Its popularity has lead casinos and players to develop basic blackjack terms that are used specifically during blackjack play. When playing blackjack, it is very important for players to understand the terms being used in order to grasp the concept of the game and to keep up with everything that is happening. The first set of terms that players should familiarize themselves with is the words used to describe the players. Each player only bets against the dealer and not against other players. At a blackjack table, players are often referred to as basemen. The player sitting to the immediate left of the dealer is called the first baseman; the player to the left of him is called the second baseman, and the player that is last to act is called the third baseman or the anchorman. Once players are familiar with the terms used for the people seated at a blackjack table, they must then become familiar with the terminology used during gameplay. These basic blackjack terms are incredibly important for adequate communication with the dealer. Once players have received their first two cards, they have four options. The first is to hit, or take another card. The second is to stand, or refuse any further cards. The third is to split, but this can only be done when a player is dealt a pair of cards. The fourth is known as 'double down' and occurs when a player doubles their original bet, takes another card, and stands on that card until the end of the round. Having a firm grasp on basic blackjack terms is the first thing players should master before attempting to play blackjack in any casino.